This is a seriously fun and exciting activity to do with the kids! It doubles as a Science Experiment too which is always great! Science and fun all rolled into one! 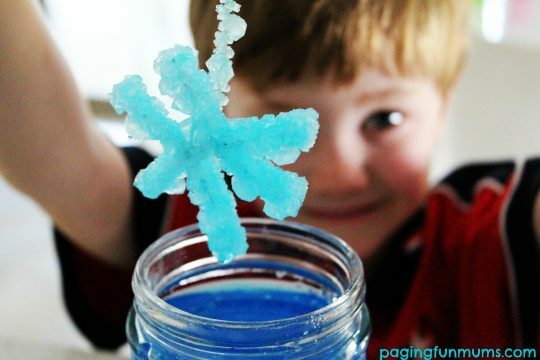 Place your pipe cleaner snowflake into your jar to make sure it will fit. If it doesn’t, trim the sides down. Cut a piece of string (about 10cms long) and tie one end to the snowflake and the other end to the pencil. Your string will need to be long enough to allow your snowflake to hang in the jar but does not touch the bottom. Once you have your length set, remove the snowflake from the jar. Boil some water and pour (carefully) into the jar – fill it to the neck. Add 3 tablespoons of borax per each cup of water and stir. Don’t worry if some of the borax settles on the bottom of the jar. Hang the pipe cleaner snowflake into the jar with the pencil resting on top of the jar. Make sure that you’ve added enough water to completely submerge the snowflake. The next day check out your beautiful Frozen Snowflake! Untie the string from the pencil and you’ve got yourself a beautiful snowflake fit for Elsa! You could also use these as Christmas Tree Decorations too! 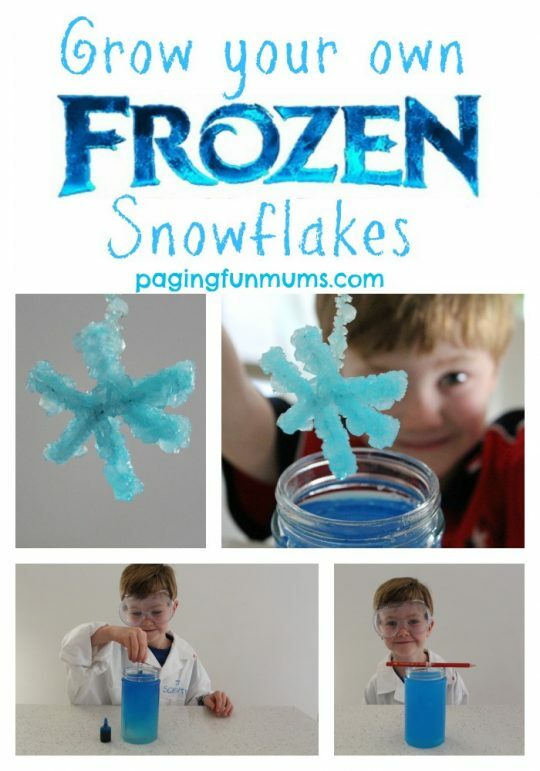 Tried this yesterday with my five and seven year old girls.. we used colored pipe cleaners in different colors and no food coloring and ended up with rainbow colored snowflakes.. was awesome! Lots of crystals formed and just as you said, overnight. Thanks so much! That’s wonderful! Thank you for letting us know and we’re so glad you had fun!